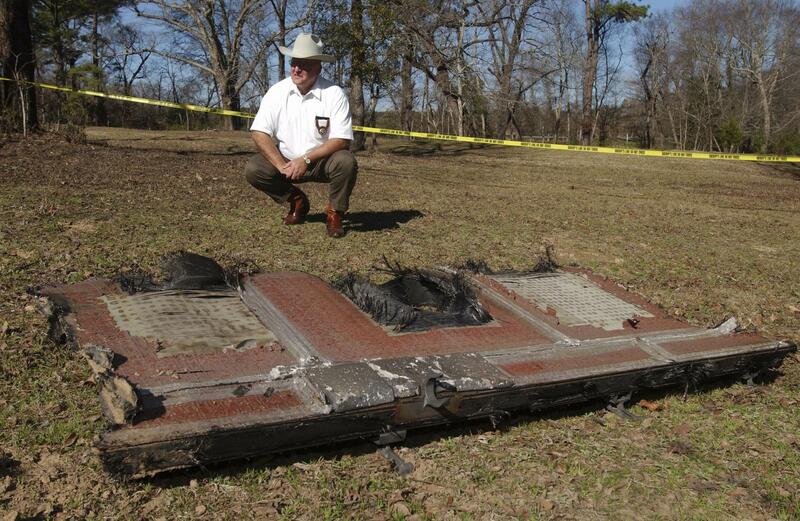 A piece of the Shuttle Columbia lies on the ground in East Texas after crashing to the earth in 2003. Today, KUT's Mose Buchele reported on LBJ and the roots of the shuttle program. On Monday, we heard a sound portrait that relived highlights of the program, and an interview with a veteran reporter on how the shuttle design was a product of political compromise. Tomorrow morning, listen for Morning Edition host Jennifer Stayton's interview about the tragic loss of the Challenger and Columbia. Texas Tribune photographer Bob Daemmrich heard our series and sent us some pictures he took in the immediate aftermath of the Shuttle Columbia disaster. He captured some amazing images of the wreckage and allowed us to upload them to our Flickr page to share with you. Here are a few.